My family never observed Lent as I was growing up and I’m not sure why I started to observe it as an adult, but I certainly have grown to cherish this time of year. I love the challenge and discipline that comes with each year. Usually I give up something. In past years I have targetted Pepsi, desserts, red meat, cheese, text messaging while driving, credit card usage. One year I also gave up, “Reading my ex-husband’s blog.” : ) This year I’m taking a different approach. Instead of giving up something, I’m doing something. 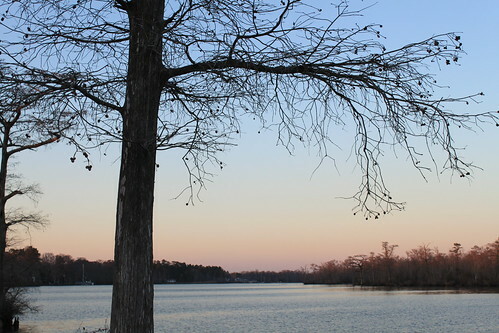 For Lent 2011, I’m spending 20 minutes each day breathing and stretching. It’s only been 14 days and so far so good. Originally I had wanted to do 10 minutes of stretching and breathing a day. Ryan encouraged me to up it to 20 minutes, which sounded like a pretty large commitment at the time. However, I have found most days, once I start, I end up well beyond, often double, that 20 minutes! I did miss one day– a day where I did an hour on the spin cycle which I also find to be very effective in the stress-releasing department. 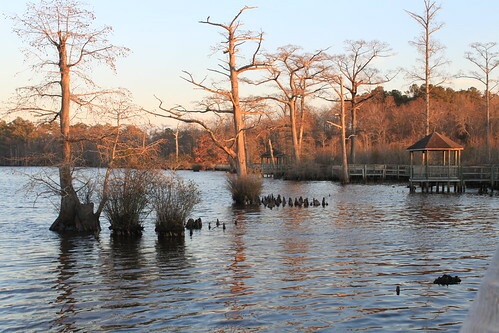 One of my last outings before I left Elizabeth City was the Fenwick Holloway Wetlands Trail. One Sunday afternoon in January, the dogs and I snuck out there for a quick “hike”. The trail was built in memory of G. Bradford Fenwick, a Naturalist, and Elizabeth V. Hollowell, a Lover of Nature. 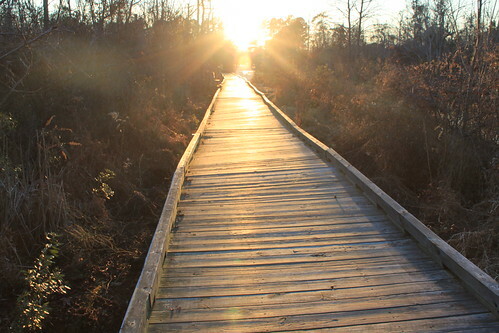 It’s a series of wooden walkways and gazebos that runs along the Pasquotank River behind the College of the Albemarle and Albemarle Hospital. It’s short and flat and full of wonderful views. That afternoon, we spied the usual Canadian Geese. 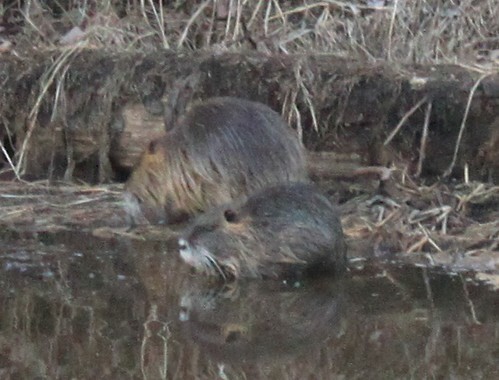 We also got to see several Nutria swimming around the walkways. 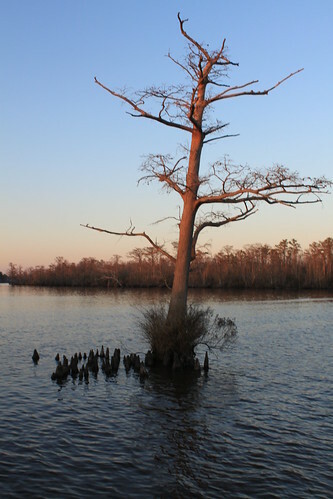 Perhaps knowing my time in the area was limited, it was the indigenous baldcypress trees that caught my eye that evening. 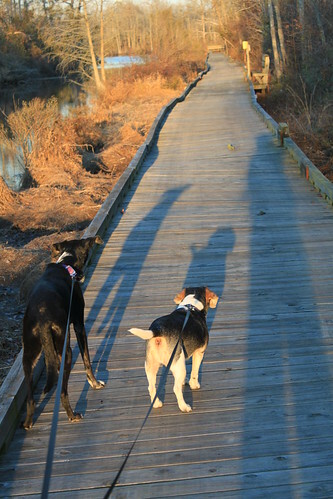 The dogs and I weren’t out long that afternoon, but we still had ample time to absorb the beauty of the Pasquotank and make mental notes of our happy times in Elizabeth City. More pictures of the Fenwick Hollowell Wetlands Trail can be found on my Flickr site. Today Ryan and I have been in Occoquan, Virginia for three weeks now. 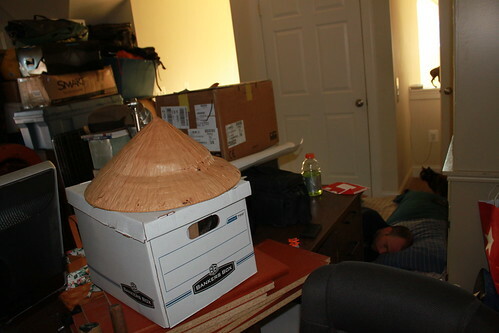 Until all the renovations are complete, all our stuff (and us) are occupying the fourth floor of my parents’ home. It’s been tight quarters. We unloaded our Uhaul on a Monday. The following Friday I left on a business trip to Wichita, Kansas. Just two days after I returned, Ryan left on a business trip of his own. So it’s been a hectic time, but now we are starting to get settled in. 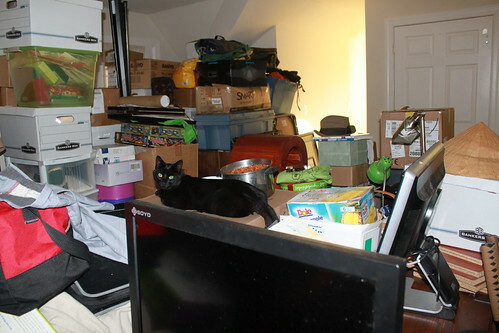 The boxes are all rearranged now, so we have more room…and significantly less avalanches. Today we just got wireless working, so we won’t have to rely on the Verizon Fivespot anymore! We have joined a new gym (It has a pool and spin cycles!!! w00t!) and found the best public library to program in EVER! They have a dedicated “Quiet Room” and they allow you to drink in it. Their internet is fast and they allow food in their foyer, which is good because I’m snacking pretty regularly these days. The best part– they don’t close until 9 PM! The dogs have always loved it here, so they are happy. 14 year Jimmie seems to appreciate having the dog door at his disposal. Unfortunately four flights of stairs is a long way to go for an old dog with unpredictable bowels, so he still has the occasional accident on his way down to the dog door. Poor guy. He tries. It didn’t take Henry long to alter his allegiances. My mother is a school bus driver. Each morning, she wakes up insanely early and feeds her dogs. Henry, of course, is quite a fan of food. Now each morning, as soon as he hears my mother’s alarm clock go off, Henry ditches us and rushes downstairs to greet my Mom. On the upside, my mother isn’t as generous with food as Ryan and I are. Henry has lost a lot of weight! Mollie the three-legged cat has also taken to the house quite well. She isn’t at all intimidated by my parents’ dogs and she freely goes anywhere she wishes. The gurgling and wheezing from her chronic sinus infection has caused some confusion. One night my brother, unaccustomed to her sounds, thought she was dying. Frantic, he tried to wake up Ryan and when that didn’t work…. my brother actually considered giving the snotty cat mouth to mouth! The two male cats, Stench and Qubit, have become surprisingly reclusive. In Elizabeth City, they were perpetually outside hunting in the swamp. Here, they stay on the fourth floor all day long. It doesn’t look like a fulfilling life to me, but they seem absolutely content.